She broke up with her boyfriend. 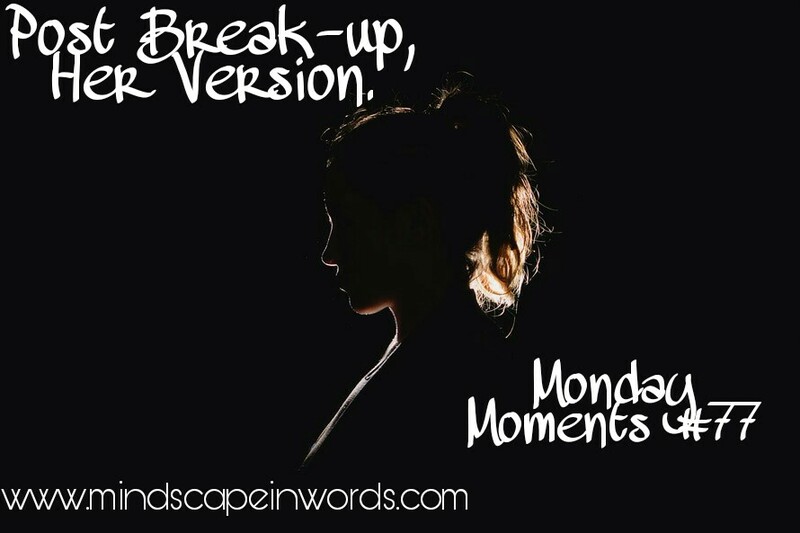 It was the most difficult thing she ever had to do; saying goodbye to someone she loved. They had been in an on-again, off-again relationship for so long that they had forgotten the meaning of what it meant to be together or what it meant to be apart. They had lost the count of fights, both immature ones and the serious ones. They were together yet apart. Yes, theirs was the love which was true because it stood the test of time and insecure people but it wasn't compatible or balanced. And funnily enough, neither of them could see how destructive they were for each other. If it is destroying you, then it's not love. To survive this separation, she began to work in the office a lot more, workout a lot more, stay alone a lot more and kept herself so busy as to not remember him. 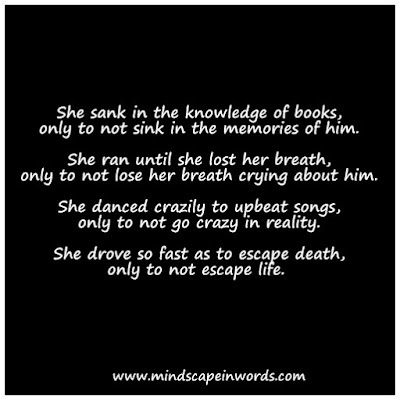 She sank in the knowledge of books, only to not sink in the memories of him. She ran until she lost her breath only to not lose her breath crying about him. She danced crazily to upbeat songs, only to not go crazy in reality. 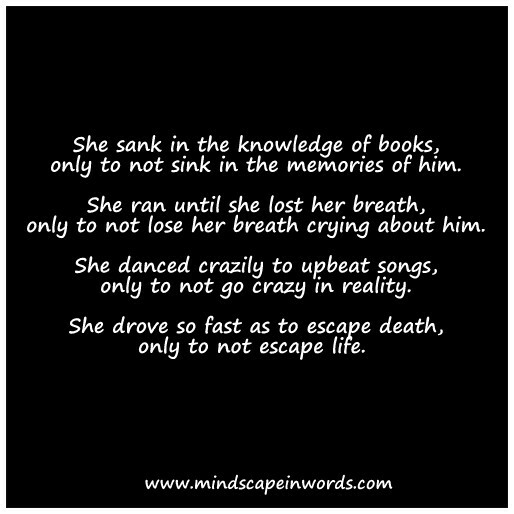 She drove so fast as to escape death, only to not escape life. She went so far away from him and herself that even she could't find the trace of who she was. He was not with her anymore and never would be. The friends for whom she left him were not with her either. She only had herself and for a while that's all what she wanted. To stay alone, find herself and not be defined by another person. Yes, it was the kind of love that comes once in a lifetime but yes, it was also the kind that makes you wonder whether love is real. You can read 'His Version' here. I know relationships like this all too well! Especially this part: "If it is destroying you, then it's not love." Interesting! I always love looking at stories through the point of view of multiple people! !